Professor Bill Sellers, from the School of Earth and Environmental Sciences, says: "Starting from an animal's skeleton, computers using machine learning can now reconstruct how the animal could have moved. However, they don't always do a good job. "But with some simple changes to the machine learning goals we can now create much more accurate simulations. We've now used this process to generate chimpanzee locomotion to explore why they walk the way they do. "The idea was to look at how much energy it costs to walk in a stable fashion compared to other movement patterns." Prof Sellers explains: "As technology has advanced and with musculoskeletal models becoming increasingly sophisticated, previous simulation models are becoming extremely unrealistic in relation to gait patterns so we have to adapt the way we think and research." 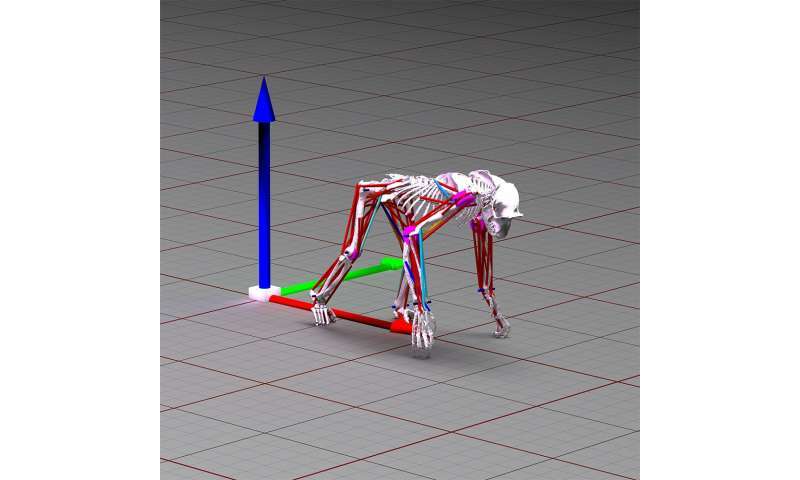 Prof Sellers added: "The realism of the gait produced by the chimpanzee model is considerably enhanced by including a lateral stability and it is highly likely that this is an important evolutionary development. "This enhanced lateral stability comes at a moderate energetic cost however, and this cost would need to be outweighed by other adaptive advantages." Was ability to run early man's Achilles heel?